All this time we have been trying to stay positive, and I think we look back on the last four weeks and say that overwhelmingly we WERE thinking positive. But it seems a sliver of our minds was trying to protect us anyway – steeling us for getting punched in the gut with bad news again. Because when we got all kinds of good news yesterday, we just couldn’t let it sink in. It seemed so unreal. But we are full of good news! First we got the phone call that the MRI results showed the tumors had shrunk. Yes, you read that right – tumors, plural! Both had shrunk! And the pineal gland was still large but still within the normal limits. They want to keep an eye on that, but currently nothing to be too concerned about. Then we got to the hospital to wait, wait, and wait some more. All while Wes isn’t able to eat because he’s going to be sedated – good times with a baby let me tell ya! 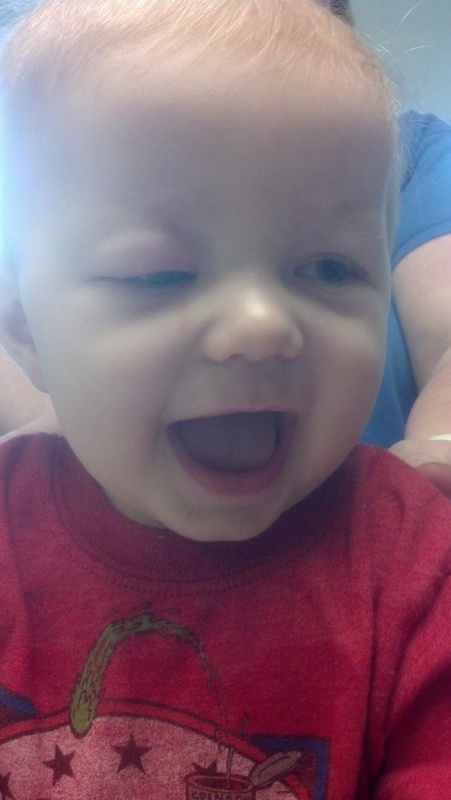 He finally went into this retinal exam and about two hours later we heard more good news! The tumors had definitely shrunk. The left eye (that is the one he can’t see much, if anything, out of because of the size of the tumor) no longer had fluid build up and no longer had a retinal detachment. The tumor in that eye was not small enough yet to do any focal therapy (laser therapy or cryotherapy), but they are hopeful it will be soon because it seems to be headed that way. They still are not sure if he will see out of that eye much at any point, but there is a chance and the chance gets better and better if the tumor keeps getting smaller. The tumor in the right eye had started out smaller than the one in the left eye, and it too had shrunk. It was small enough for focal therapy, and they were concerned about the way that the tumor looked that it might break off and move to a different part of the eye, so they did cryotherapy on the right eye. He looks like he’s been in Baby Fight Club, but otherwise he is happy and playing. He started the second round of chemo last night and so far this morning he is still happy and playing. He is sporting a Popeye shirt today – it seemed only fitting. Thank you everyone for all of your positive thoughts and energy! It is working! Normally the first rule of Fight Club is you don’t talk about Fight Club, but in this case you can tell everyone the good news! So happy to read good news. Go Wes!! Melissa – thank you for taking time to leave such positive comments! Wonderful wonderful news. Elphie and I have seen double rainbows and meteors over the ocean and we’ve been channeling that beautiful energy of nature to Wes. His ribbon is in our car so our thoughts are with him always in our travels. Thank you Judy! I love the pic of you and Elphie on the beach! Thank you for taking time out of your dream vacation to think of us! Thank you Catie. I know Wes knows that he is loved tremendously, powerfully, overwhelmingly – because he is happy as happy can be just about all the time.